Standing amid a prime Bukit Timah neighbourhood dotted with landed houses and prestigious schools, Coronation Shopping Plaza is hardly what one might call a kampung, or village in Malay. But that is exactly how some describe the 35-year-old mall, where shop owners and their regular customers have struck up royally long friendships and are on a first-name basis. "It is a nostalgic neighbourhood centre," said Mr Alan Chong, 59, who opened Alan Optics there in 1986. "They feel that this place is very friendly and homely." Ms Betty Chong, who has worked at E-Ran Stationery for about 15 years, agreed: "It is more kampung here. We have that rapport with customers, and everyone's familiar with each other." The 60-year-old has also seen some of her customers - students from nearby schools such as Hwa Chong Institution, Nanyang Girls' High School and National Junior College - grow up. "I have seen them graduate, start working and start families. There are some who come back just to chat with us," said Ms Chong, breaking into a smile. Built in 1979, the four-storey mixed development has 111 shop units on the first three floors, 20 apartments on the top level and a basement carpark. The plaza likely took its name from the adjacent Coronation Road. Along with Empress Road and King's Road, these were once private roads belonging to the estate of Hokkien merchant Choa Lam Tiong. The roads in the area were later given their current royal names in 1912 to commemorate the coronation of King George V, who ascended the throne in 1910 and had his coronation in 1911. He reigned till his death in 1936. As a pupil at Farrer Primary School in nearby Lutheran Road in the 1980s, Mr Toddi Suhaimi remembers Coronation Shopping Plaza as "Silo", after an old supermarket which was there then. There is still a supermarket - the space is now occupied by FairPrice - on the ground floor. "During the flood days in Bukit Timah, there was a huge drain between my school and 'Silo', where most boys would catch fish or tadpoles," recalled the 41-year-old telecommunication executive. "I remember the mall had video rental stores, computer shops, a comic store and a book store. Those were the shops we frequented the most," he said, adding that there was also a kacang puteh seller and mamak shops beside the building selling snacks such as 10-cent sticks of satay and ice-cream. Gone are the floods and roadside peddlers today, but the plaza nonetheless remains a reliable haunt for those in search of anything from a stylish perm to a hearty meal. "The food here is good and authentic. It is more Malaysian, more creamy, not so spicy," Mrs Irene Lam said, as she slurped up a spoonful of laksa at My Cosy Corner, a popular eatery where boss Leong Swee Meng, 67, has been serving up local and Japanese dishes such as popiah and beef teriyaki for the past 16 years. Mrs Lam, a 71-year-old retiree who lives in Australia, makes it a point to visit the popular joint about three times a year, whenever she is in town visiting her son, even if it means taking a taxi from his place at Sentosa Cove. Coronation Shopping Plaza, like Katong Shopping Centre or Beauty World, all of which were "born" in the 1970s and 1980s, look their age compared to shiny new malls such as Jem or Westgate in Jurong East. But it is precisely the dated feel that has endeared them to many. "It is a mystical feeling, like you are going back to the 1970s, and you can relax," said Mr Leong. "I love this old shopping mall. It has a charm about it," said Ms Visnja, a 50-year-old economist from Croatia who gave only her first name. She lives with her family in neighbouring Hillcrest Road. "My son sees his dentist here, and my husband buys from the tennis shop here. There is also a stationery shop, a supermarket, tailors and a photo shop." 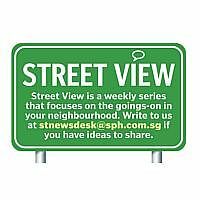 Another Bukit Timah resident, Mr Frederic Joubert, is also content with the mall's "old-fashioned" style: "I am not into the bling bling on Orchard Road." "You don't have to care about what you wear when you come here," quipped the 42-year-old regional sales manager from France. Student Tan Mui Yee, 17, from Hwa Chong Institution, said she and her friends usually go there for lunch after school. "It is like a tradition for us. It is cosy and quiet, and there is a sense of familiarity," she said. Mr Ramalingam Rathnasami Pillai, 68, who started a small tailoring shop after retiring five years ago, also prefers the mall's smaller crowd. He gets about five customers a day, but is satisfied. "It is not much, but I can survive. It is very peaceful here," he said. But not all businesses have survived. The multiple Local Area Network gaming centres, once a hit with teenagers, have gone. In their place, maid agencies and tuition centres now make up the bulk of the tenants. And while new food and beverage outlets such as Starbucks have sprouted up, old favourites like Prince Coffee House and Golden Rooster have either moved out or closed for good. Shop owners say fewer students are coming to the mall as a result these days. But a new crowd might pass through its doors when the nearby Tan Kah Kee MRT station opens in 2016. Mr Patrick Ong, 62, chairman of the building's management corporation, said that subject to funding and consent from the landlords, there are plans to add new lifts and more ramps to make the mall more disabled-friendly. This comes after feedback from some tenants and customers that the lift does not serve the basement carpark, rendering it inconvenient for the elderly. The mall is due for renovation, said Mr Ong. Its last major facelift was about 10 years ago. Tenants such as Madam Fathema Hamid, 52, who sells toys at her shop Toy Plaza, are eager for an upgrade. "We need to keep up with the times, she said. "Hopefully, that will bring in more people."